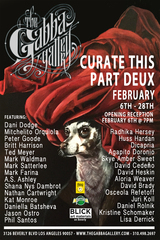 Artists Reception: Saturday, February 6, 2016, 7pm - 11 p.m.
Curate This 2 is the second annual exhibition highlighting the artwork of well-respected Los Angeles Artist/Curators presented by The Gabba Gallery from February 6 to February 26, 2016. The 2000 sq. ft. Gabba Gallery will be filled with the work of contemporary Los Angeles tastemakers who both create and curate art. The energy of transformation is predominant in this showing of artwork, with explosions of color and explorations of form. The viewer is compelled forward from room to room, and reflective of Los Angeles itself, the diversity of the work generates both jarring juxtapositions and, ultimately, improbably harmony. Artists such as critic, writer, and curator Shana Nys Dambrot, artist/curator Mitchelito Orguiola and Agapito Doronio of Collective Aesthetics are among those included in this survey. The artists included in Curate This 2 are contemporary Los Angeles-based curator/artists selected by Gabba Gallery curators Jason Ostro and Phil Santos as a testament to their vision for the Los Angeles art scene. Artists include: A.S. Ashley, Agapito Doronio, Britt Harrison, Dani Dodge, Daniel Rolnik, David Brady, David Cedeño, Huss Hardan, Jason Ostro, Juri Koll, Kat Monroe, Daniella Batsheva , Kristine Schomaker, Lisa Derrick, Mark Farina, Mark Satterlee, Mark Waldman, Mitchelito Orquiola, Nathan Cartwright, Osceola Refetoff, Peter Goode, Phil Santos, Radhika Hersey, Dicapria, Shana Nys Dambrot, Skye Amber Sweet, Ted Meyer. Curate This 2 opens on February 6, 2016 and will be on view through February 26, 2016. A reception for the artists with renowned DJ Mark Farina (whose work is in the show) will take place on Saturday, February 6, from 7 - 11 p.m. and is sponsored by Blick on Beverly, Hubert’s and Perrier.